You're going to want to expand this gorgeous, high-resolution photo to full screen, and use it as your desktop wallpaper. This transparent critter is a brachiolaria, which is the second larval stage of many types of sea stars. The photo was taken by Alex Semenov in July 2013, in Russia's White Sea. Most sea star embryos hatch at what is called the blastula stage. After the blastula develops a pair of small arm-like appendages, the larva becomes known as a bipinnaria. After three additional arms are added, it becomes a brachiolaria. Until now, it has been bilaterally symmetrical: the left and right sides are mirror images of eachother, as in the photo above. 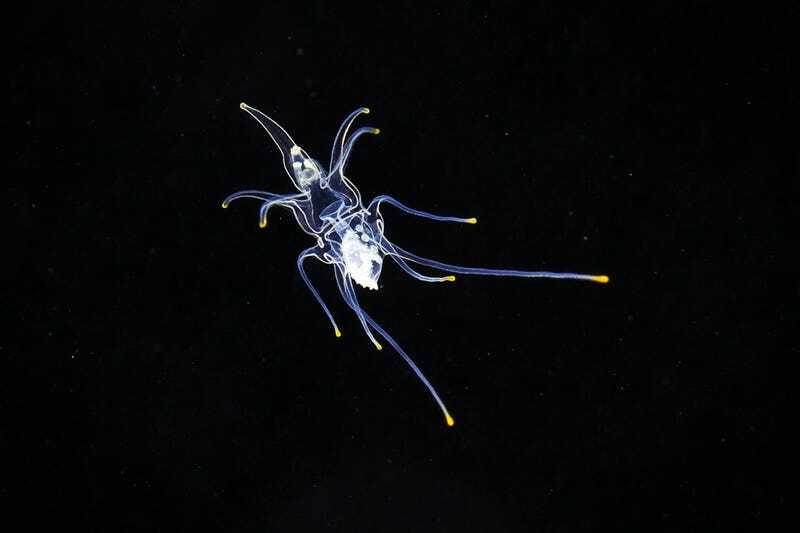 Once fully developed, the brachiolaria adheres itself to the seafloor, where it undergoes metamorphosis to become a 5-armed juvenile sea star, which looks more familiar to us. No longer bilaterally symmetrical, the critters are now pentaradially symmetrical. The juvenile measures only about 1 millimeter in diameter. Here are the photographic details for those interested: Canon EOS 5D Mark II, with a Canon EF 100mm f/2.8L macro lens. ISO 100, f/13.0, 1/200 sec. The photo is copyright Alexander Semenov, and was reproduced with permission. Check out his work on Flickr, which mainly features marine invertebrates. There's some gorgeous photography in there.